Here, at GurgaonBakers, we are currently caught in the trend of vintage style wedding cakes that are a perfect fit for rustic weddings. Simple, fuss-free, yet oozing tons of charm and grace, these cakes are a great addition to your dessert table. These cakes are close to nature as they are inspired by Mother Nature herself. 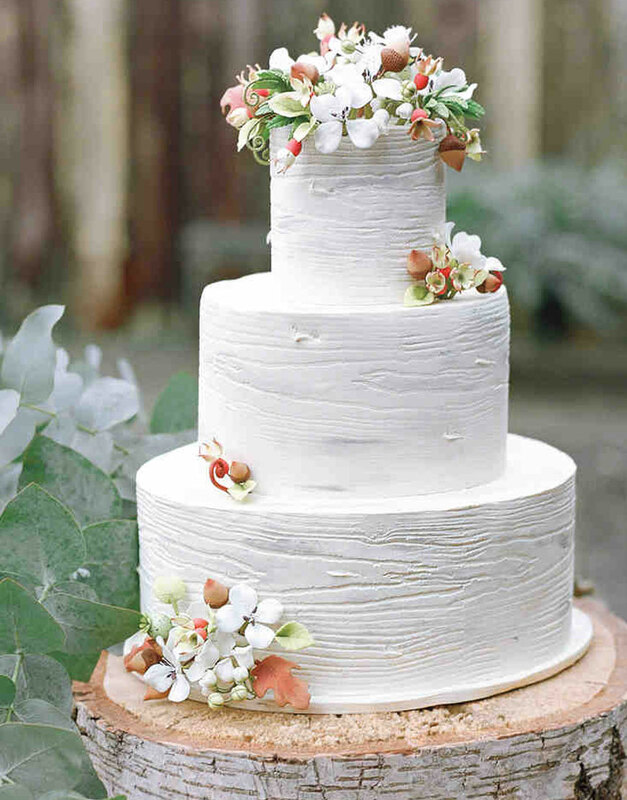 The “Charming Rustic Wedding Cake,” consists of three tiers. Each tier smaller than the previous one and stacked one above the other. Each tier is frosted with delicious creamy buttercream and covered with fondant, which has wood grain pattern imposed on it to make it resemble the bark of the tree. The cake is finished off with the fresh flowers, which brighten up your day. This cake will surely add smiles, happing and positive vibes on your big day. Nowadays, there is no restraint to dream about your wedding cakes. Voice out your mind, and we can create the perfect wedding cake, just as you want it to be. Ping us for more customizations and to check wedding cake prices.